As I was tucking my daughter, Olivia, to bed tonight I was telling her I was so proud of how fast she can run. She makes running look easy(something she most definitely didn't get from me)! I told her one day she needs to run in races. She immediately gasped and said "No people will be watching me!" I then talked with her about the fact that God gave her a gift of running and if we choose to we can use our gifts for his glory. I said "Liv, don't think about yourself, but focus on God and it takes the pressure off of you". This story is just a glimpse into something everyone, including myself, struggles with and that is confidence. What is confidence? The dictionary defines it as "the belief in oneself and one's powers or abilities". Some people think confidence is a good thing while others think it is a bad thing or view it as being prideful. The real question is what does God think about confidence? I personally believe he made us to be confident people. Not confident in ourselves like our dictionary term describes but confident in who we are in him. Confidence in ourselves is pride and Proverbs 16:18 reminds us that "Pride goes before destruction, and haughtiness before a fall". But when we are confident with who we are in God then it brings glory and honor to him. He wants his children to be bold and confident, not timid and weak. We are to be a reflection of Him and no one wants to serve a weak and timid God. We tend to see two extremes of people: prideful(full of themselves) or meek(and proud of it). Because of this fear of being prideful we can tend to back down, slump our shoulders and not walk in the fullness God created us to be. I used to be the "humble and proud of it" type of person. Ironic I know but you know that person(or maybe you are that person) who takes pride in being humble and passive. I remember trying to blend in with the crowd and making sure to not make eye contact with anyone out of fear of being noticed. The problem with that mindset is that you lock yourself in a cage and you miss out on God's will for your life. You will never know His will until you look up. God does not make accidents or rejects. He knit you together in your mother's womb and you are fearfully and wonderfully made(Psalm 139:13). 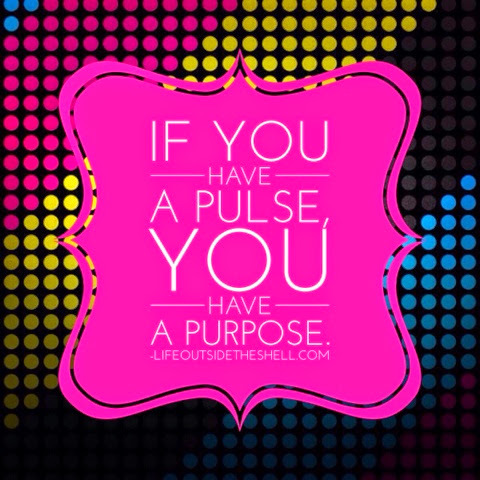 If you still have a pulse you still have a purpose. Your next step is to look up. When the enemy whispers in your ear that you are no good and have nothing to offer to the world, look up and say hello to a passing stranger. Watch the shock on their face at the fact that someone noticed them. When you begin to allow God to use you in your imperfections it turns something alive on the inside of you and you begin to find a purpose again. I have to admit, there are still some crowds of people that are "scary or intimidating" to me. When I notice myself starring at the ground in those situations I remind myself to look up to the one my confidence comes from. When we try to have confidence in our own abilities we will feel insecure every singe time. It is only when get our confidence from God that we can truly be confident in who He created us to be.